The ecosystem services concept promised a new paradigm for resource management but uptake has been disappointing slow. This failure to translate the conceptual into practical application has transpired because the literature confuses, obscures or simply lacks pathways for doing so. For example, frameworks are useful for bringing together the main components of a concept and illustrating the linkages between them. But when components are ill-defined, drivers of change ignored, or linkages blurred, conceptual frameworks add little value to on-the-ground resource management. A murky starting point (such as a framework) makes it extremely difficult for decision makers to know precisely which policy response would be most effective or where to target management actions to support the sustained provision of desired ecosystem services. To overcome this problem, emphasis needs to shift from ecosystem services themselves and towards the tangible biophysical components that are fundamental to their provision – natural capital stocks (e.g. soils, water, vegetation). There is a wealth of ecological research that explains the relationship between stocks and ecosystem processes. And unlike the cryptic, poorly understood, and dynamically complex ecosystem processes, we can see, comprehend, and measure stocks and their attributes. We also know a fair bit about how stocks respond to various interventions – such as applying fertiliser or planting trees in gully-heads. All this knowledge gives us the confidence that by manipulating attributes of stocks, we can influence ecosystem processes and subsequently the flow of ecosystem services. Direct management of natural capital stocks therefore provides the pathway for making the ecosystem services concept more relevant to resource management. 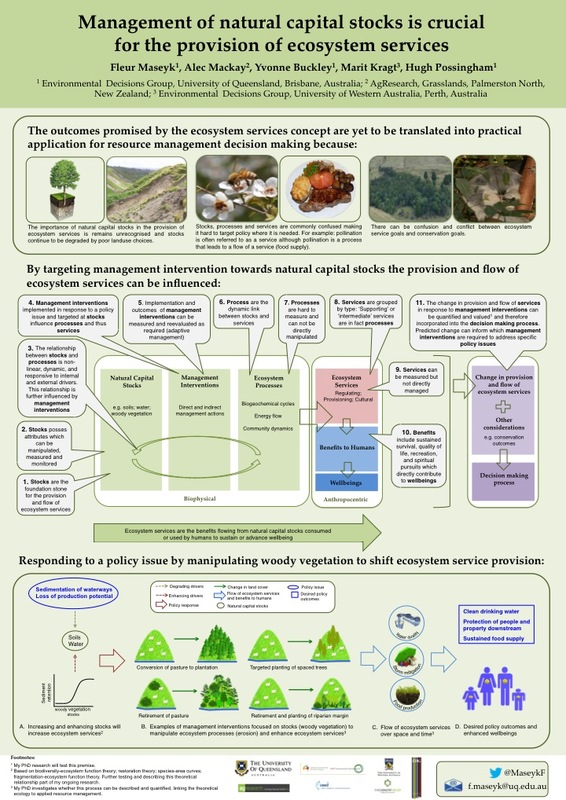 We illustrate this in our poster presented at EcoTas13 in Auckland, demonstrating how responding to a specific policy issue by manipulating stocks can shift ecosystem service provision and deliver desired policy outcomes. This entry was posted in Fleur Maseyk, News & Events, Publications and tagged conference, EcoTas, livestock, management, poster. Bookmark the permalink.